PPA – Not So Far Away! Didn’t we just finish the EGTRRA Restatements? Here is a helpful hint regarding how to make this upcoming restatement process your easiest ever: Did you know you can restate in batch with ASCi’s Plan Document System? This Batch Feature means your plan documents are processedautomatically by ASCi’s Plan Document System. Clients who used the Batch Feature for EGTRRA told us the restatement process for them was exponentially faster and even …fun. This auto-restatement feature, like all ASCi Plan Document features, is included in the ASCi Document System at no additional cost. As part of the ASC Comprehensive Product Suite, your Plan Documents integratewith the rest of the ASC System including Valuation, 5500s and the new Client & Task Tracking System (CATTS). Integration decreases the need for manual data entry and risk of plan discrepancies. Whether you are a current plan document user, or shopping around, you can emailasci@asc-net.com for more information about the most efficient processes for restating your plan documents. Your success is our focus. Robert Long, CLU, ChFC, APM, Product Manager at ASC, has been with the ASC Team for 14 years. 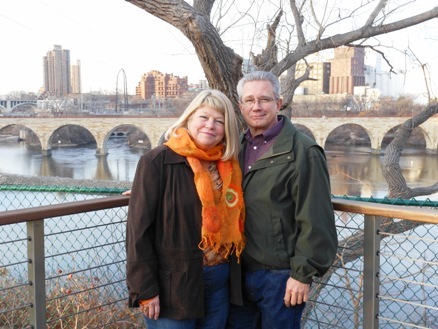 A graduate of Manchester University in Indiana with a BS in Business Administration, Bob grew up in New Jersey and currently resides in Hudson, WI (Minneapolis/St. Paul area). Bob and his wife Sandy have three grown children and one grandchild and will be celebrating their 35th anniversary this year. Bob is a friendly, positive person who descends from Founding Father of the USA, Alexander Hamilton. Bob is an avid reader of the Wall Street Journal (but really prefers Car & Driver magazine!). Bob is responsible for the DV Direct and Gemini products and clients. He works with the ASC programmers to continually enhance those systems as well as promoting the systems through product demonstrations, attending conferences, and participating in sales, marketing and strategic planning efforts for ASC. Q: What have you been focusing on lately? A: Primarily Gemini Web Portal development. Many TPAs are not aware of how the internet can transform their way of doing business, and how easy it is to implement. For example, by using the Web Portal clients can completely eliminate the annual back-and-forth with clients to collect and clean-up the census data. The internet automates the collection of this data and literally reduces the time involved from days or months to hours. In addition to focusing on Gemini, I’m training several new Daily Valuation clients. 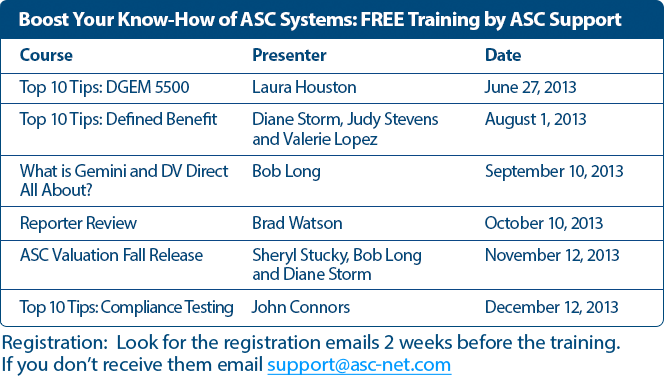 When a client purchases DV Direct from ASC, we teach them how to set up their office processes. I actually go to the client site and help them do this. Then with help from my colleague Tom Lusby, we’re available to help them go up the ‘daily valuation’ learning curve. We’ve helped many companies become experts at providing daily valuation for their own clients/plan sponsors. Q: What sort of changes have you noticed in the pension industry throughout the years and what are some of the most significant developments? A: I’ve seen a multitude of change. At ASC I’m continually seeing how advances in technology can literally transform the speed and cost at which an office can process plans. In addition to enormous changes in technology, fee transparency is probably the most recent significant development. But I think the focus on giving participants the right tools to appropriately project retirement income is really important. People need to know if they are saving enough (most aren’t). Q: Who has been your role model at ASC? A: I’m privileged to work with an amazing group of co-workers at ASC. They all are great role models in their own way. Q: What skills and practices are you aware of that have contributed to your success? A: Somewhere along the line I realized I was pretty good at helping people reach consensus while facilitating a group discussion or indirectly as a participant. Good communication skills help, applying a logical, tactful, common sense approach to objective problem solving. Q: What is something that you are really proud of and why? A: I’m very proud of the success our DV Direct clients have achieved and continue to achieve. These small to mid-size TPAs have learned how to offer the most up-to-date services, at affordable prices, that rival the largest financial institutions in the country. Their success translates into successful 401(k) plans that directly impact 401(k) participants all over the country. I’m proud to participate in that. I’m also proud of what I accomplished with ASPPA and the impact ASPPA educational programs have on industry professionals nationwide. A: I’m an extremely positive person with a very calm demeanor who enjoys life. I rarely get rattled and have no time for negativity. I enjoy life too much! Although, having learned how to drive in Jersey…don’t get in my way! A: Fortunately I don’t have a lot, but I’ll usually take a walk or do a little weeding in my vegetable garden. Surrounding myself with my positive friends also helps to minimize any stress as we always focus on the good things that happen in our lives. Q: Can you tell us about some of your hobbies? A: My favorite pastime is listening to music, but you’ll also catch me gardening, taking long walks and cruising in my little convertible on those ‘top-down’ days. My newest hobby is playing with my new grandson. Q: Do you have any favorites such as music, sports, etc.? A: Hmmm… The Beatles, the Godfather trilogy, and Da Chicago Bears. Q: What are some of your fondest memories at work, home or vacation? A: I’d love to say all the great office parties we have…..;-^ No really, my fondest memories are enjoying life with my family and friends – doesn’t get any better than that! The ASC Actuary Team attends conferences around the country, throughout the year, giving you an opportunity to meet with them face-to-face. The entire Actuarial Team, Diane Storm, Judy Stevens, and Valerie Lopez, attends the Enrolled Actuaries Meeting each year in D.C.
Additionally, at least one of the actuaries attends many of the other annual conferences. If you missed us at the ACOPA Advanced Actuarial Conference (Las Vegas), look for us at the Western Benefits Conference (San Diego), the ACOPA Actuarial Symposium (Chicago) or ASPPA Annual in DC. Don’t be shy about finding us and saying hello! We appreciate hearing your experiences with the system and suggestions for improvement. Your success is our focus. Boost your knowledge with the Support Team’s FREE webcasts for 2013! All webcasts are designed to help you get the most out of the ASC software so you can work and run your business as efficiently as possible. All webcasts are recorded and may be viewed at a later date. In addition to these live, topical webcasts, our recorded Training Series for DC/401k, Compliance Testing and 5500 Systems are available on the online Client Support Center Website under the Training tab. Currently in production is the DB Training Series, which should be published in the Fall. Take an hour out of your day to learn something new!